So we have a slighter older Harry and Draco (attempting some adulting, lol,) trying to figure out if and when to reveal their relationship to their friends. They decide to see if Ron can keep a secret by feeding him false information... which is just too fun a concept! Lol. This isn't a perfect fic - but it's quite fun and actually ends up being quite positive! Warning: adult references/humour and v. mild swearing. 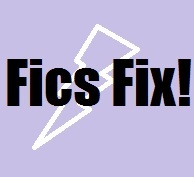 And that's it for this week's Friday Fics Fix! Don't forget to share and comment!